You will hear plenty of companies who work with tankless water heaters tell you that they are the best option for everyone. You may also hear from companies who work only with traditional water heaters tell you that tankless options are not worth the added cost. 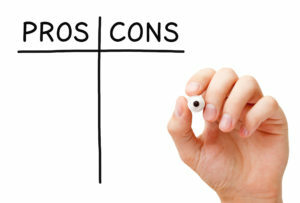 If you want to hear the truth, you can read on to find both the pros and cons of this option. You can also contact The Stanley Louis Company at 800-217-6527 to find out more about what might work best for your specific home. When you first turn on the faucet, the cold water that has been sitting in the pipes will come rushing out. After that single second of cold water, you will get instantly hot water – and an almost unending stream of it. This issue is generally caused by a tankless water heater being unable to send enough hot water to numerous outlets at the same time. It can be easily prevented by ensuring you have the right size and type of unit to handle your regular hot water usage. One of the biggest reasons that people love their tankless water heater investment is because it can last much longer than a traditional unit. If you get a basic, but high-quality, standard water heater, you should expect it to last for about ten years. If you choose a tankless water heater, you can double that. It’s true that it last twice as longer but it also costs about twice as much to purchase at tankless unit. That does not take into consideration the fact that installation can also be more complex, which can raise the total cost even higher. Then again, you get more for your buck than a unit that lasts twice as long as a traditional water heater: the average tankless water heater is 22% more efficient than a traditional model. This means that the average homeowner can save hundreds of dollars every year. It is common for water softeners to be needed with tankless water heaters. This can add to the cost and can result in taking up a lot of space. However, this and other equipment is not always needed, so it is best to get a quote before letting this dissuade you. At The Stanley Louis Company our only goal when recommending a water heater is to ensure that our clients get a model that will work for them. Contact us now at 800-217-6527 if you would like help choosing your own unit.